Writing thank you notes is part of getting married – people need to be thanked for attending your wedding and giving you gifts. But after five, the rhythm, if indeed it was ever established, begins to whither and trite, dull and stereotypical phrases begin to appear as if out of nowhere. Here are a few thank yous to help you on your way. It was lovely to see you again (if they attended the wedding). It would be great when you are next in town, to meet up (if they didn’t). Hope your child / cat / aunt / mother is well? I can’t believe how (child’s name) has grown! He / she will be graduating before we know it! Thank you for sharing our special day with us! Thank you for being a part of our ceremony of love and commitment. Our wedding would not have been complete without your support and love. Thank you for the very generous wedding gift! We’ve used the money to buy xxxxx / pay for our new stoep etc. The xxxx will look incredible in our bathroom / kitchen / lounge. Thank you for the (towels) – now I can throw the threadbare numbers we’ve got in our bathroom away! Thank you so much for the crystal wine glasses. We now have a complete set! How thoughtful of you to buy us the xxxxx. It was my personal favourite item on the list! We’ll find a really special spot for this in our home. It’s so thoughtfully chosen to suit our home. You know our taste so well, it will look incredible in our lounge/kitchen/bathroom/bedroom. We are in the throws of planning our daughter’s wedding and ‘thank you’ letters/cards came up. 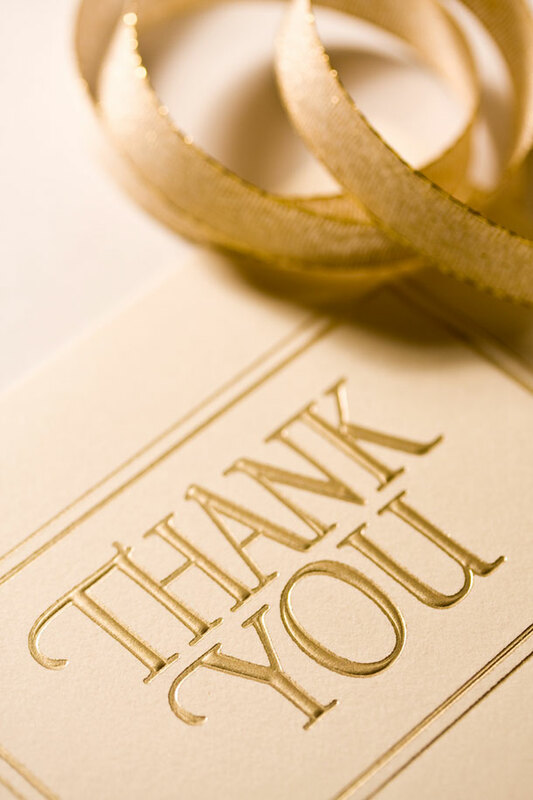 In the past ten years or more, I cannot recall a single time when we received a thank you card for a wedding gift. If our bride-to-be doesn’t remember her manners in this regard, I’ll personally ‘string her up’!